Lucasfilm broke the internet today when it finally unveiled the trailer and title for Star Wars: The Rise of Skywalker. Social media platforms are currently abuzz with first impressions of the reveal, including one from Rian Johnson. Obviously, Johnson has a considerable stake in the upcoming installment, having directed the series’ previous entry with Star Wars: The Last Jedi. But more importantly, he’s as big of a fan as anyone else. Johnson shared his own response to the film’s first round of footage on Twitter. You can check out what he had to say below. Johnson turned down the chance to helm the impending conclusion of the Skywalker Saga. However, there’s always been a mutual sense of respect between Johnson and The Rise of Skywalker director J.J. Abrams. Although The Last Jedi polarized Star Wars fans when it came out in 2017, Abrams was one of the most vocal supporters of Johnson’s work on the film. In fact, he had an additional bit of praise for Johnson during The Rise of Skywalker’s panel at Star Wars Celebration in Chicago. Abrams specifically commended the casting of Kelly Marie Tran as Rose Tico, which he called “the greatest thing” that Johnson did. Meanwhile, Johnson is still developing his own trilogy of Star Wars films unconnected to the primary series. But following Bob Iger’s announcement that the franchise will go on hiatus after The Rise of Skywalker, it’s not clear when Johnson’s first offering will arrive. 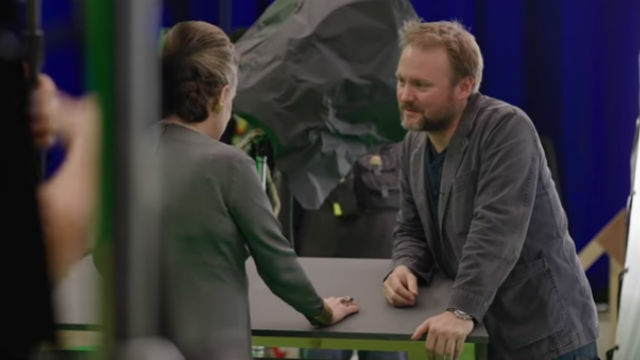 What do you think of Rian Johnson’s reaction to the new Star Wars: The Rise of Skywalker trailer? Let us know in the comment section below!